Megan graduated from the University of Toronto with a degree in Biology and Forensic Science in 2010. 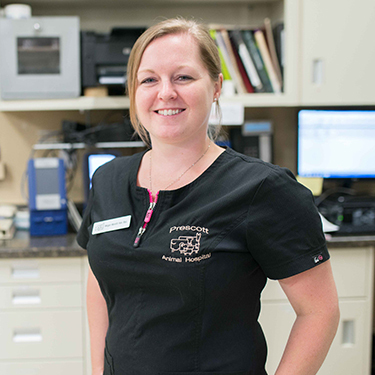 In 2011 she moved back to her home town of Oxford Mills and joined the team at Prescott Animal Hospital as veterinary assistant. Megan is our laboratory queen! She spends much of her time in the hospital in the lab performing a wide variety of analytical testing and quality control procedures. She lives with her husband Brian, their two children, her Australian Shepherd Hogan and cat Fernando. Megan’s soft spoken, easy going temperament can put anyone at ease. We would be lost without her!